Eva mats are the perfect mats for jiu jitsu competitions. 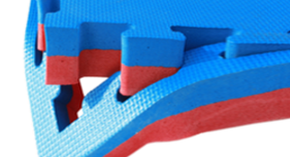 In fact EVA interlocking jigsaw mats are the most commonly found mats in any competition. I have visited quite a few myself and have found that most organisers of jiu jitsu competitions use 40mm red / blue jigsaw mats. Whilst you may see tatami mats in use at judo competitions they are rarely used in BJJ comps. So next time you are looking to use mats for your BJJ comp call Ezy Mats. Ezy Mats are Australia’s leading supplier of interlocking EVA jigsaw mats.